Listen to your Studio Ghibli music collection in style with these adorable Totoro earbuds! Guaranteed to brighten up your day, these in-ear headphones come styled in the shape of everybody’s favorite woodland creature. Set your coffee cup apart from the rest with a design that brightly captures the happy woodland creature under his umbrella. These stylish Totoro cups are all individually hand painted and will preserve the vibrant colors over time. 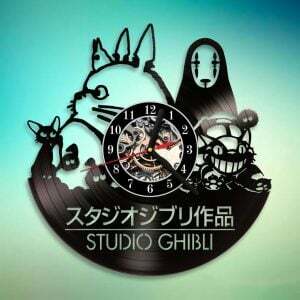 Let all your favorite anime characters tell you what time of the day it is with this Studio Ghibli vinyl record wall clock! This creative design creates the perfect gift for Studio Ghibli fans and record collecting enthusiasts alike. Going from sea to land can get you looking a little bit crazy! Check up on your appearance with this compact mirror inspired by the Studio Ghibli’s film, Ponyo. It features a die cut image of Ponyo under the sea and two mirrors inside the kisslock closure. May all your bubbles pop! Half the fun of this Calcifer bath bomb is enjoying how adorable he is when you hold him. The other half is the joy you get when you throw him in the water and watch as he melts. Hidden embeds inside can also cause a rainbow effect! Light up your home with these adorable LED lit Totoro lanterns! These fairy lights come already assembled and are battery operated, so you can pretty much hang and enjoy them anywhere in the house. Totoro is here to help let his fans instantly know what time it is! This adorable time telling device features a very curious Totoro clock face in a natural wooden frame. Perfect addition for the home, office, or anywhere you decide to place it. You’ll be turning heads on the street with Ohmu by your waist side! Made in the shape of the enormous larvae from Nausicaa of the Valley of the Wind, this custom bag is hand made from genuine for a one of a kind accessory. Okay, so you might not be able to copy Mei and take a nap on top of one of these cute Totoro plushies, but they are plenty big enough for cuddling! Available in all the Totoro sizes. What more could you possibly ask for? Meet Haku, the beautifully crafted River Spirit from Spirited Away! This adorable, fully poseable doll of Haku in his dragon is completely handmade from high quality faux fur, polymer clay, glass eyes and a wire skeleton. Spirited Away fans can now establish an eye-catching look with this beautifully hand crafted Haku earring! Made from polymer clay in his dragon form, this fake gauge earring will create the illusion Haku is dangling from your earlobe. Make any outfit pop with a set of earrings that look just like mini Bath Tokens! Each earring contains three tags that are handmade from polymer clay, each with their own unique symbols to perfectly replicate the ones seen in Spirited Away. Who wouldn’t want to carry around one of these adorable balls of soot all day long? Add a touch of cuteness to your wardrobe by storing spare change in this little Soot Sprite coin purse. A cute gift for a Studio Ghibli fan! Incorporate some of your favorite Studio Ghibli memories into your home with these minimalist movie posters! All prints are available in either a colorful or natural green filter. Each sold separately or as a complete set! Dish up some delicious snacks for all the spirits of the forest! By using this My Neighbor Totoro themed cookie cutter, you can now effortlessly incorporate the cute’n fuzzy creature into your daily baking routine. Stay warm the Japanese way and eat your meals everyday like you’re in a scene from My Neighbor Totoro! This square kotatsu futon cover will make you even more popular when you host dinner and tea parties with Studio Ghibli fans. 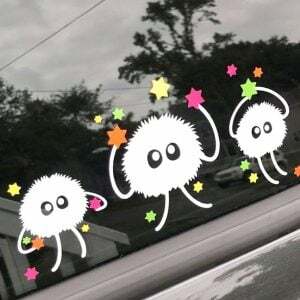 If you’re the type of person who prefers the company of Studio Ghibli’s famous fuzzy creatures over family, you can now decorate your car with these Soot Sprite family stickers! Show off your geeky side on the road! Give your nails a fun and unique makeover with this set of Studio Ghibli decals! Includes 36 waterslide prints in a variety of popular Studio Ghibli characters, making them the perfect way to animate your next manicure.